Freeney Williams Ltd was founded by Mike Freeney and Rick Williams. Rick has a strong and proven combination of skills, knowledge, experience and qualifications. He is a Chartered Fellow of the Chartered Institute of Personnel and Development, and an Associate of both the Business Disability Forum and the Business Disability International. Before setting up the company, Rick spent over 25 years in the Public Sector in both local and national Government. During this time he worked in a range of high profile posts in HR and senior management. 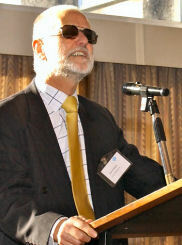 Rick now specialises in the field of disability equality. He is a highly effective consultant and trainer, who has worked in many high profile organisations both in Europe and the UK. Rick's international work has included working with the ILO in Geneva and Turin, acting as a special adviser to the Bermudan Government and advising NGOs in Moscow and Vienna working in the field of moving disabled people into work. Rick is blind and the combination of being a disabled person and experienced as an HR professional and senior manager, gives him a high level of expertise in organisational policies and attitudes towards disabled people and associated diversity policies and practice. Other associates within our team have specialist experience in Fire and Safety, Emergency Evacuation, Employment, Commercial and Property Law, IT, and Building Design. Clare has an in-depth knowledge and experience across the diversity and disability fields. Clare is a Chartered Fellow of the Chartered Institute of Personnel and Development and has delivered a wide range of disability-related projects and training to organisations in all sectors and at all levels. Clare is an experienced HR consultant and employment law specialist, advising clients on the practical application of legal issues across their business. As a management development specialist, she has delivered training across the UK and Middle East. Jan is one of the UK’s leading access specialists. While working as an Occupational Therapist in Housing, Jan gained a postgraduate diploma in Environmental Access from the Architectural Association in 1995. Since then she has worked extensively as an Access Consultant for a wide variety of clients throughout the UK - assisting them in ensuring they develop a fully accessible environment for their staff and customers. She does this by advising on a best practice approach alongside ensuring they meet their duties under the Equality Act 2010 and associated legislation and guidance. Jan’s approach is client-focused and practical, and aimed at ensuring that clients understand the access issues in their widest sense. To do this she provides realistic and prioritised solutions. Jan has extensive experience of auditing a broad range of properties which include cathedrals, stately homes, ancient monuments as well as modern entertainment and office complexes. She also advises architects and planners on access issues during the development stage of projects. Steve is one of the original associates of Freeney Williams Ltd and worked alongside Rick to develop our groundbreaking approach to auditing the accessibility and usability of websites, e-recruitment, intranets and other digital information. Along with Rick, Steve co-authored the recent Click Away Pound survey and report. With a background in museum and gallery exhibitions and electronic publishing, Steve has extensive experience in interactive learning and how users interact with electronic information. Recent projects include advising on the accessibility and usability issues for several high profile websites including Odeon, National Trust and the Business Disability Forum. Kerry has a proven track record in a broad range of training and consultancy projects across the disability field. Before joining Freeney Williams Kerry spent 9 years at the Business Disability Forum leading the team who provided practical support and advice to a broad range of organisations in all sectors and at all levels. In that time, Kerry set up and managed the Advice line. As part of this role Kerry oversaw the provision of in-depth advice on the employment of disabled people and serving them as customers both from the organisational and person viewpoint. She provided feedback on organisational policies, set up the highly regarded Emergency and Law Enforcement Network and co-wrote the well-recognised Business Disability Forum publication “Mental Health at Work”. Kerry has developed and designed bespoke customer service training for many of our clients. This training enables service providers to establish an individualised approached to disability-savvy customer services while maintaining the needs of core business. Kerry has significant dyslexia and has developed and facilitated specialist workshops on this subject. She also acts as a mentor to others who have dyslexia to support them in managing the effects of their condition at work.